Portland, OR Acting Class / Camera Ready! ​Whether you're a background extra for a TV show or landed a role in an indie feature film, there are many times you are expected to arrive to set "Camera Ready" or you may hear it as "Hair and Makeup Ready." Not everyone quite understands what this means and many times talent arrives on set NOT ready which is frustrating for the production. When you arrive "Camera Ready" you save the production time and cost! 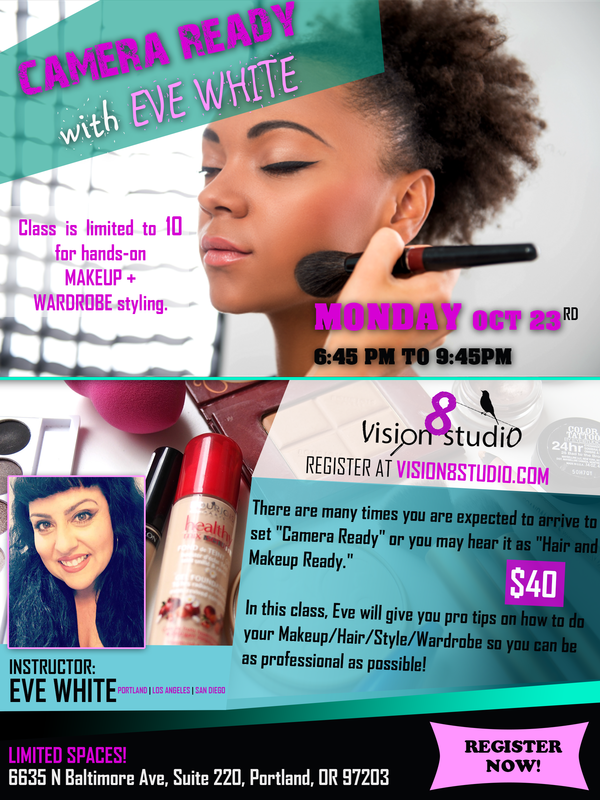 In this class, Eve will give you pro tips on how to do your Makeup/Hair/Style/Wardrobe so you can be as professional as possible! Class is limited to 10 people for hands-on makeup and wardrobe styling. What to bring to class: Your current makeup and hair kit. Also, what you consider "wardrobe basics" - or, bring your questions about what a basic clothing kit looks like. BONUS: Eve can also put together customized kits for you after you have taken the class, so she can see everything you need. Those will be priced separately directly with Eve based on individual needs. Eve's next class will be on FASHION later this year!